The Insurance Info tab accepts data needed for insurance claim upload or printing 1500 forms. 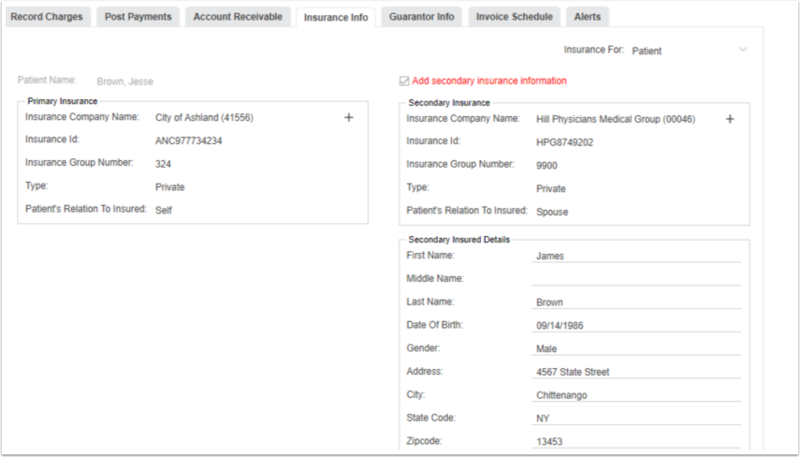 Click on Accounting ($ icon) to access the billing section of a patient's medical record. Navigate to the Patient tab. Click on the Insurance Info tab. The insurance screen will open up. 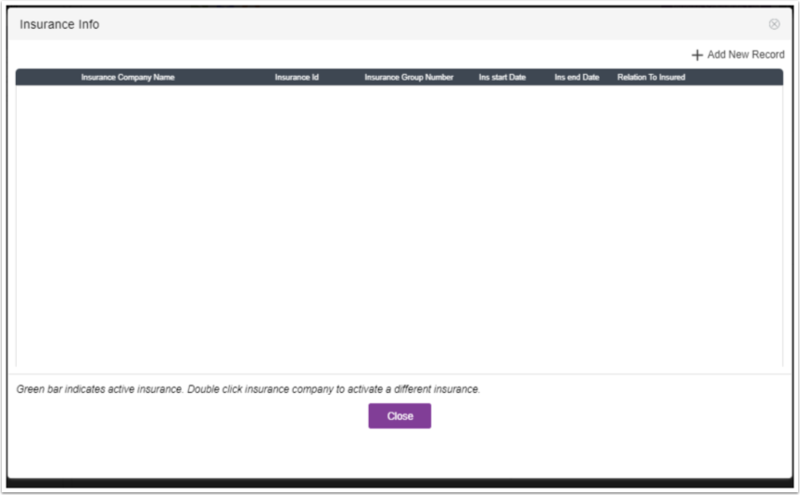 Use the pull down menu to select Insurance For: Patient or Partner. 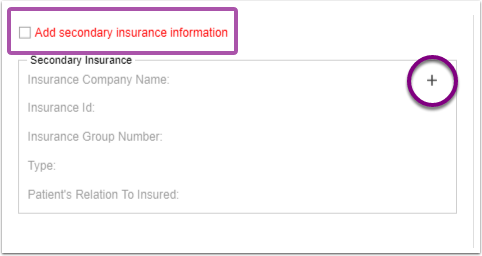 Click the + sign to add the Primary Insurance information. The Insurance Info window will open up. Click + Add New Record to add new insurance information. 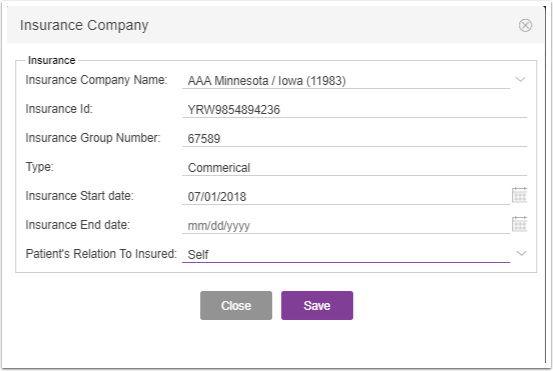 The insurance information can now be added. 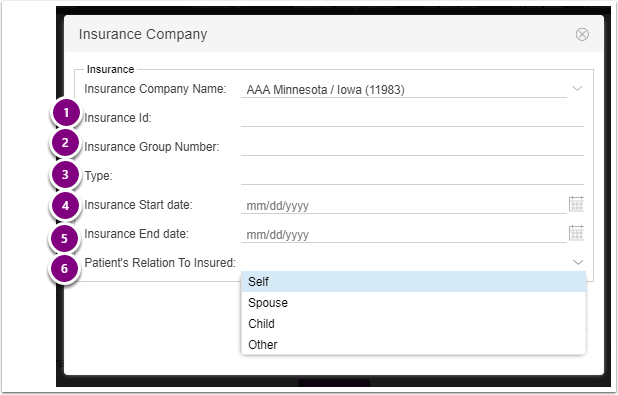 Click on the pull down menu for the Insurance Company Name to display a list of your common insurance companies. Choose the appropriate Insurance Company Name from the pull down list. 6. 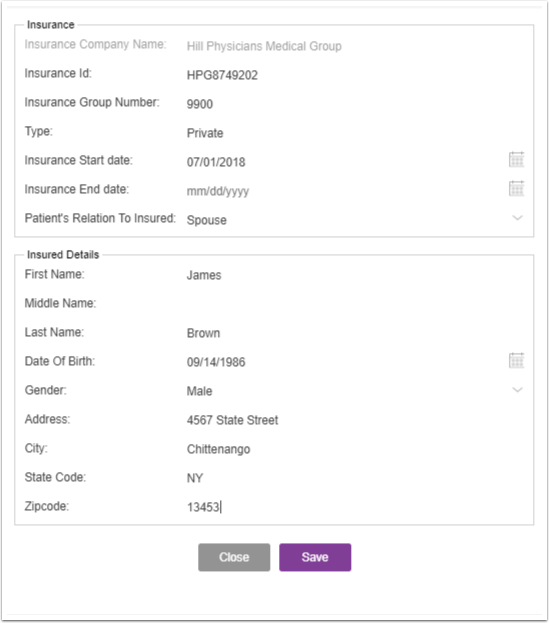 Patient's Relation to Insured (Use the pull down menu to select Self, Spouse, Child or Other). The start and end dates are to help you keep track of when insurances are valid. 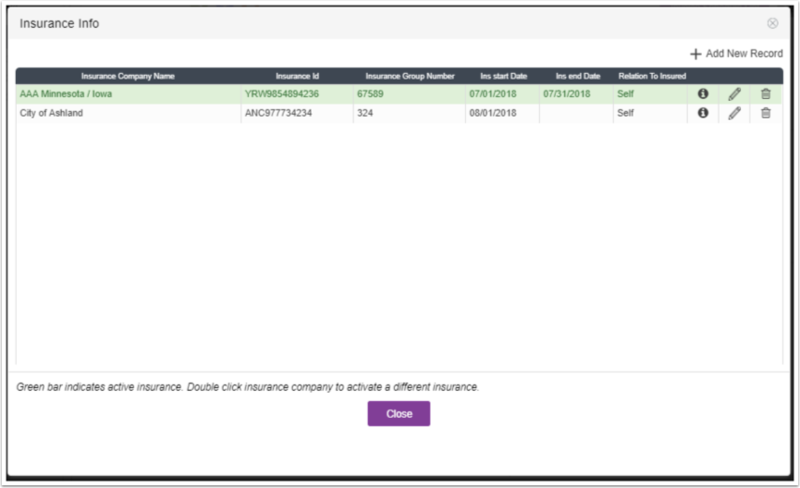 The active insurance will not switch automatically based on these dates. If any patient relation other than self is selected, you will be prompted to add the additional Insured Details. Click Save to close the Insurance Company screen. You must double click on the insurance company to activate the insurance. 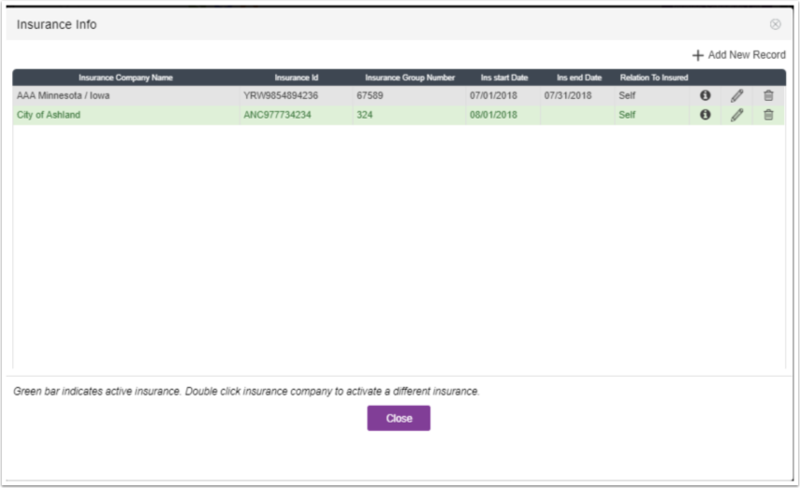 The active insurance will now be highlighted in green. 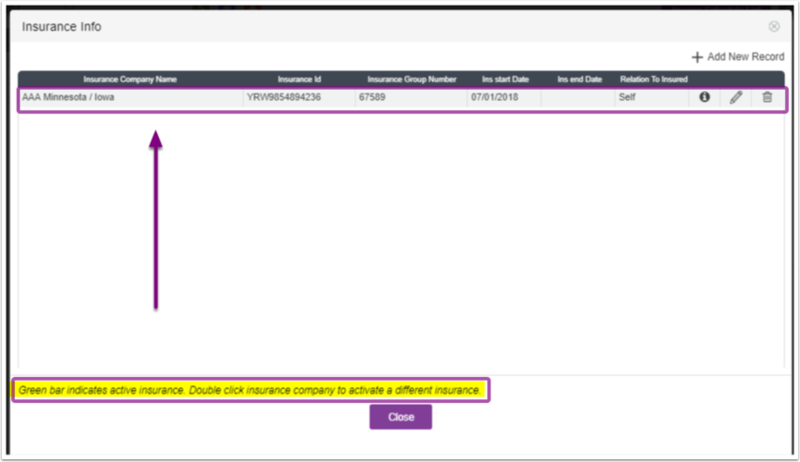 If you add new insurance information, you will want to keep the prior insurance information but you need to make sure that you double click on the new insurance company to designate that as the active insurance. The newly added insurance, City of Ashland in this example, is now highlighted in green, indicating that it is the active insurance. You can activate and deactivate insurance companies as necessary, if you will still be utilizing prior insurance information to process/edit claims, etc. 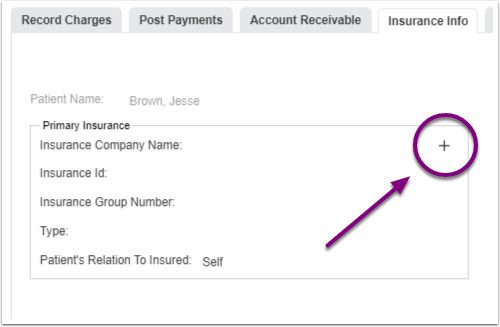 Add secondary information the same way the primary insurance is entered, once you have selected the Add secondary insurance information box. 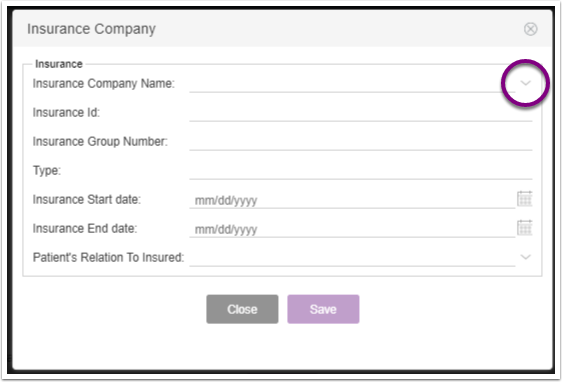 Enter the secondary insurance information and click Save to exit out of this screen. Don't forget to double-click on the insurance to make it active. 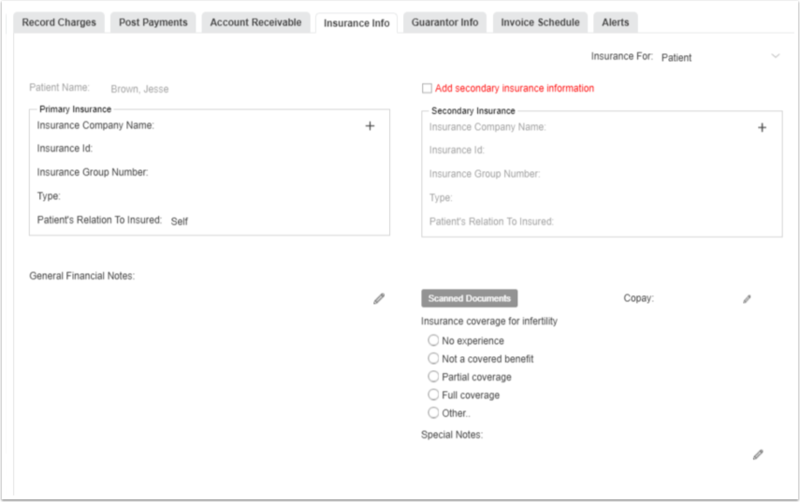 The completed Insurance Info screen showing both the primary and the secondary insurance information. If the patient's insurer is not listed you may use the Insurance payer addresses Manage Payers feature found in EMR Settings to add a insurance company to the list. Learn how to manage payers here. 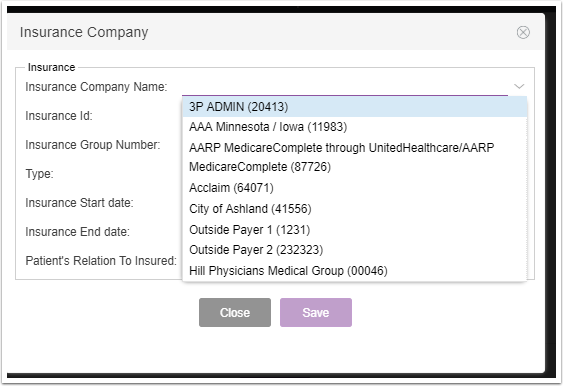 This step is very important if you are using or planning on using our Change Healthcare billing integration. Fill in the rest of the information as necessary. The Manage Payers button will only be available in an integrated system. You Must Have a Fast Internet Connection. Two Connections are Even Better! The #1 Support Question - What do I do when my computer freezes?